Senior powerbroker and former state development minister Ian Macdonald resigned from NSW parliament today with some of the former minister’s travel expenses now the subject of an ICAC inquiry. Tonight the 7.30 Report can reveal a link between his office and a man described in parliament as a crook. KERRY O’BRIEN, PRESENTER: It would be hard to find a government in Australian history that has lost more ministers in a single term than the Labor government in NSW. Two resigned last Friday to bring the total to 12 who are gone since the last election in 2007, including two premiers. It’s an understatement to say this government is on the nose with voters, the full import of which is about to be rammed home in no uncertain terms in a by-election at the weekend. But now with the State Budget due tomorrow, one of those who resigned on Friday, senior powerbroker and former state Development Minister Ian Macdonald, has compounded Labor’s headaches by going a step further and announcing his resignation from the Parliament itself, effective immediately. With some of the former minister’s travel expenses now the subject of an ICAC inquiry, tonight the 7.30 Report can reveal a link between his office and a man described in Parliament as crook. Nick Grimm reports. NICK GRIMM, REPORTER: Last week’s shock resignations of two ministers continued to dog the NSW Premier today. KRISTINA KENEALLY, NSW PREMIER: Again, I’ve only asked the public to judge me and to judge my government on those things that we deliver, the results and the services that we deliver. NICK GRIMM: Juvenile Justice Minister Graham West went, saying he was sick of partisan politics. But it was the resignation late on Friday of the Cabinet heavyweight, the Minister for State Development Ian Macdonald, which is set to have the biggest repercussions. KRISTINA KENEALLY (Last Friday): Minister Macdonald has told me there were errors made in terms of things that were billed to the Government that should have been billed to him personally. He has advised me of that and he has advised me he will be repaying those costs. NICK GRIMM: The minister had been under fire over the real cost to taxpayers of V8 Supercar racing at Homebush Bay, a deal he’d guaranteed would not cost a penny over $30 million. According to a leaked Auditor-General’s draft report, the true cost was 50 per cent higher. There were claims too about the sums splashed out by the minister to gazump Queensland’s bid to host the rugby league grand final. Then, questions emerged about free flight upgrades and who paid for the minister’s airline travel on a trip to the Middle East. LEE RHIANNON, NSW GREENS: Premier Kristina Keneally’s got major problems, and one of her major down-fallings could be her failure to have kept Mr Macdonald only the backbench. NICK GRIMM: But when the 7:30 Report recorded this interview last Thursday, Ian Macdonald was still bullish about the controversy swelling around him. IAN MACDONALD, NSW STATE DEVELOPMENT MINISTER (last Thursday): I believe I’m doing a good job for this government, securing industry, investment and events in this state. Now if some people don’t like someone who’s prepared to break the mould of NSW losing out to either Queensland or Victoria, then so be it. NICK GRIMM: But all that had changed the next day when news broke that Ian Macdonald had claimed the cost of his travel to Dubai from the public purse. That was said to be the final straw for the Premier, who’s asked the Independent Commission Against Corruption to examine allegations about the former minister’s travel arrangements. JOURNALIST: Other issues other than the $2,800 airfare. KRISTINA KENEALLY (last Friday): I give you this iron clad commitment: that when the review is completed, it will be released. NICK GRIMM: Tonight the 7:30 Report can reveal the former minister’s resignation came as he faced questions on another controversy. LEE RHIANNON: Look, there was clearly many knives that Mr Macdonald could have fallen on and it is interesting that the one he fell on was relatively small. NICK GRIMM: Last month the 7:30 Report looked into the circumstances surrounding the collapse of the Burrangong Meat Processors, leaving behind multimillion dollar debts. The 7.30 Report also obtained a Commonwealth Bank internal investigation tabled at a Senate banking inquiry 10 years ago. It revealed the abattoir owners, Grant Edmonds and his girlfriend Kim Noble, had been investigated over allegations of fraudulent and dishonest conduct when they both worked at the Commonwealth Bank in the 1980s. Do you still have confidence in the integrity of Grant Evans? IAN MACDONALD (last Thursday): I have no opinion whatsoever in relation to what he’s done in terms of his business activities. It’s not my job to delve back into what may have occurred 20 or 30 years ago. NICK GRIMM: The 7:30 Report has discovered however that Ian Macdonald’s office was alerted to Grant Edmonds’ past five years ago. Minister, can I show you this email? It reveals that your office was advised five year ago that Grant Edmonds had been the subject of an internal Commonwealth Bank investigation into fraudulent conduct at the bank. IAN MACDONALD (last Thursday): Who’s this gone to? NICK GRIMM: … that you were never aware of this internal investigation, how do you account for the fact that that information was sent to your office and it wasn’t brought to your attention apparently? IAN MACDONALD: It certainly wasn’t brought to my attention ‘n’ I’ve never seen it. NICK GRIMM: The email was sent by banking activist Bruce Ford after he discovered that Ian Macdonald has appointed Grant Edmonds to an important government advisory role as chairman of a committee overseeing the National Livestock Identification Scheme. BRUCE FORD, BANKING ACTIVIST: I, in my naiveté, one could say, thought Mr Macdonald or his department would have a closer look at it and, you know, consider whether they had a fit and proper person and reconsider what their appointment was about. NICK GRIMM: The email contains a confirmation that it was received by Ian Macdonald’s office. How do you account for the fact that that information was sent to your office and it wasn’t brought to your attention apparently? IAN MACDONALD (last Thursday): It certainly wasn’t brought to my attention ‘n’ I’ve never seen it. Never seen it. NICK GRIMM: Certainly ministerial officers receive thousands of emails every year. The man who was running Ian Macdonald’s office at the time denies ever seeing this one. Before Tony Hewson became Ian Macdonald’s chief of staff, he’d been Mayor of Young, so he knew how important the abattoir was to the town. He’d also worked as one of Grant Edmonds’ senior managers. What’s more, a search of ASIC company records reveals that Tony Hewson was once a director of one of the Burragong group of companies. This very dramatic information was received by your office at a time when Mr Hewson was running your office and you’re telling me now that this information wasn’t brought to you? IAN MACDONALD (last Thursday): The information wasn’t brought to me; that’s the first time I’ve seen anything of that nature. NICK GRIMM: Mr Edmonds was last week labelled in Parliament as a crook who should be behind bars. KATRINA HODGKINSON, BURRINJUCK, NATIONALS (June 3, 2010): The best conclusion that could be drawn from his actions is that Mr Edmonds is an unethical crook. Too many people in Young have been hurt by Mr Edmonds’s unethical and criminal behaviour. NICK GRIMM: While Mr Macdonald has denied a close relationship with Grant Edmonds, he acknowledges a longstanding friendship with Tony Hewson. He also admits he’s made trips to China with both Tony Hewson and Grant Edmonds. Tony Hewson declined to be interviewed for this story, but in a statement to the 7.30 Report he denied any business relationship with Grant Edmonds. However, that’s unlikely to prevent the calls for a wider inquiry into the former minister’s dealings. DAYS before an inquiry into his expense claims was due to be handed to the Premier, the disgraced former minister Ian Macdonald suddenly quit Parliament yesterday after 22 years. Mr Macdonald resigned three days after he quit cabinet and less than a week after the Herald revealed he had failed to declare $30,000 worth of airline upgrades in late 2007. 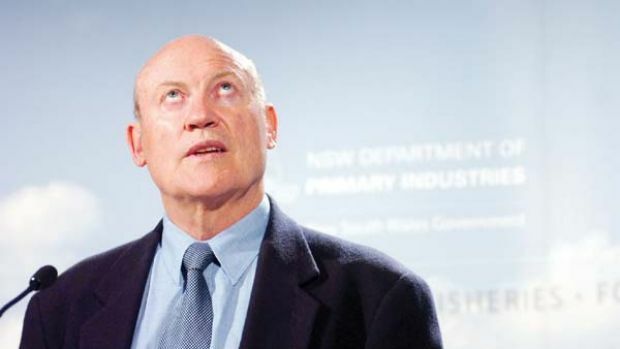 The former state development and major events minister, nicknamed ”Sir Lunchalot”, is being investigated by Brendan O’Reilly, the director-general of the Department of Premier and Cabinet, over expenses he charged for a trip to Rome and Dubai in 2008 with his wife and two friends. The Independent Commission Against Corruption has been investigating aspects of the trip. On Wednesday, the Premier’s office referred to ICAC an email received by one of its policy officers about an unnamed party, not Mr Macdonald, involved in an overseas trip. It is understood to involve an allegation of corruption by one figure in the Australian equine industry against another. Mr Macdonald was not due for re-election to the Legislative Council until 2015. By resigning so soon after quitting as minister, he has ensured his superannuation payout will be larger than if he had remained in Parliament for his full term. Mr Macdonald was forced to resign on Friday after the Herald revealed he had claimed his $2815.50 economy airfare to Rome back from the taxpayer after telling the Premier he had paid for it himself. Mr Macdonald was also facing new questions about his relationship with Grant Edmonds, the operator of a failed abattoir in Young. ABC TV’s The 7.30 Report revealed 10 days ago that Mr Edmonds had been investigated for fraud 20 years ago while working for the Commonwealth Bank. An internal bank report, tabled at a Senate inquiry into banking, shows the investigation found Mr Edmonds had been deceptive and dishonest. He was never charged with any offence in relation to the alleged fraud and denies any wrongdoing. Mr Macdonald has denied a close relationship with Mr Edmonds, whom he appointed to a national committee on livestock inspections. He has also denied any knowledge of his allegedly unsavoury background. But last night The 7.30 Report revealed an email had been sent to Mr Macdonald’s office five years ago by a whistleblower warning of Mr Edmonds’s background. Mr Macdonald’s chief of staff was then Tony Hewson, a close friend of the minister, who had been a senior manager of the abattoir before joining Mr Macdonald’s staff.